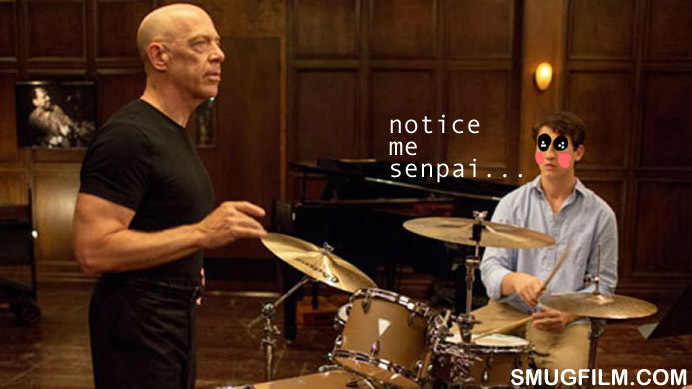 Finally saw Whiplash, last year’s little-engine-that-could (and did—four Oscars). Can’t say I’m surprised at all that it was so well-received by critics and audiences alike—it’s a visceral, exciting film, one that, given its mundane subject matter, takes you by surprise with its intensity. An artificial, superimposed intensity, sure (a realistic film about getting good at drums would be more the vibe of Jeanne Dielman, but louder) but an intensity that is undeniably effective. At certain moments, I was quite literally on the edge of my seat. My praise for the film ends there though, other than to say that J.K. Simmons delivers a phenomenal performance, his career best. And, there’s a few genuinely funny parts when you least expect them. In general though, the film is a shallow one. More specifically, it’s two-dimensional—so two-dimensional it’s damn near cel-based.